BIG COMFORTABLE HANDLES...equally spaced around the top opening of the bag and 1/3rd of the way up from the bottom. Convenient for 2, 4, or six people to carry. Cushion grip handles now standard on lower carry handle band (see photos above). TUBULAR WEBBING DRAWSTRING TOP...avoids the pitfalls of other bags with their awkward cinch straps or rope and grommet closures that wear out and pop loose. Larger drawstring loops to make opening and closing easier. SELF STORING...pocket built right into the bag (see photo below). Fold & roll the bag then stuff into the pocket. Even has a web loop to hang the stored bag conveniently in an out-of-the-way spot. HEAVY DUTY BALLISTIC CLOTH BASE... covers the full lower section of the bag as well as the bottom. Provides the most abrasion resistance available from any bag in the industry. VINYL DOUBLE BOTTOM... A second layer inside our outstanding Ballistic Cloth bottom/floor panel. Keeps your envelope dry as you drag the carry bag through the early morning dew. Also helps prevent moisture seeping into, and soaking through the bottom of the bag. CUSTOM COLORS...of fabric and webbing available (subject to availability, additional upcharge). CUSTOM SIZES... and shapes of bags available (call for quote). AVAILABLE IN ROYAL BLUE WITH A BLACK BOTTOM 1/3RD. CUSTOM COLORS AVAILABLE - Subject to availability, additional UPCHARGE. CUSTOM COLORS AVAILABLE - Subject to availability, additional UPCHARGE. CINCH-DOWN OPTION ON NEW CARRY BAG MADE IN USA #CDN N/A $90. 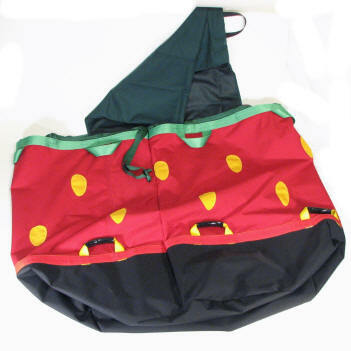 CINCH-DOWN RETROFIT ON USED CARRY BAG (PICTURED ABOVE) MADE IN USA #CDR N/A $150.